Entertaining at home? Whatever you're planning—big bash or intimate soirée, cheery beer fest or elegant wine tasting—an inviting and accessible built-in bar featuring handsome hardwood cabinetry can help transform mundane household space into the life of the party. And once the festivities are over, all the accouterments such as glasses and silverware, not to mention wine, liquor, and mixers, can be stored in those cabinets, either displayed behind glass or hidden by solid wood doors. "Today, the term 'built-in bar' covers a variety of possible set ups," notes Linda Jovanovich, of the American Hardwood Information Center at www.HardwoodInfo.com. At its simplest, a bar may occupy the end of a kitchen island—nothing more than a short length of dedicated countertop above a neat grid of cubbyholes to store wine and a small fridge to cool it when necessary. Slightly more ambitious bars comprise a niche or doorless closet fitted with wood shelves and cabinets, a countertop, and perhaps a faucet and sink. Then there are more imposing affairs, the modern equivalent of a traditional butler's pantry, fully plumbed stations where not only drinks but also finger foods and hors d'oeuvres can be prepared and served. Finally there are dedicated sit-down bars. Complete with stools, behind-counter serving space, and semi-professional equipment, these pull-up-a-chair facilities have special requirements that take them beyond our present consideration. "Many houses and apartments have a closet or unused space that can easily be converted into an attractive and useful built-in bar," says Laura Bohn, a New York-based interior designer who has done this for several clients over the years. "If you live in a house with stairs, the space beneath them is often an ideal place to install a small, modestly equipped drinks center. It should be able to accommodate enough countertop to prepare cocktails, enough storage for a liquor cabinet, and maybe enough room for a fridge or wine cooler." A sink is not an absolute necessity, but if the small space you requisition is near a kitchen, powder room, laundry, or bathroom, you may be able to make use of the existing plumbing and create a true wet bar. As Bohn notes, one advantage of using such confined spaces for built-in bars is that they can be closed off when not in use, so that a commandeered closet looks just like a closet, an appropriated staircase just like a staircase. "But a well-designed, well-crafted hardwood mini-bar needn't be hidden," she adds. "Made of walnut, cherry, or some other distinctive wood—my favorite is maple—it can be an integral and pleasing a part of the décor." Of course, larger butler's pantry–style built-in bars cannot be hidden. Ideally, they are located discreetly in transitional spaces between kitchens and adjacent dining or living rooms. But in today's more open-plan houses, such built-in bars, often dubbed buffets, are likely to be in either the kitchen or living area itself—wall-spanning installations that are on full public view and should therefore look as elegant as pieces of fine hardwood furniture. A New Jersey beach house kitchen features maple cabinetry painted white, a honed black granite countertop and an island with under-counter cubbyhole wine storage and a glass-door wine refrigerator. Phot courtesy of I Fromkin Interiors and ©Peter Rymwid Architecture Photographer. 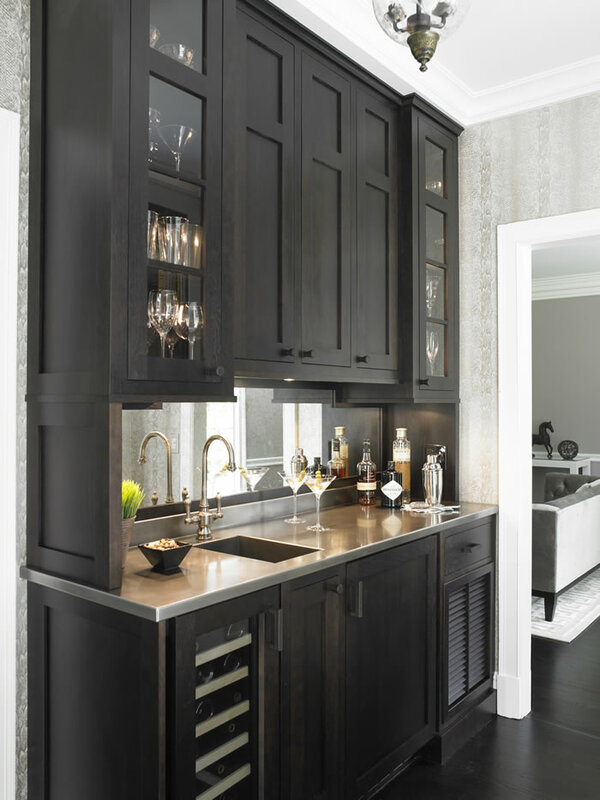 A dark walnut butler's pantry-style built-in bar by kitchen designer Christine Donner, features a pewter-tone stainless steel countertop, faucet, and integral sink. Below the counter are a wine cooler and beverage fridge. Courtesy of Nancy E. Hill. "Walnut is very popular right now for this type of bar," says Christine Donner, a kitchen designer in New Canaan, Connecticut. "It is an elegant wood and its cool tones complement the white-and-silver palette that my clients currently favor. It can be bleached to a lighter tone, left 'natural,' or stained much darker, almost all the way to black. Limed oak, bleached to a lovely honey-blonde color, has a marvelous midcentury-modern feel that is slowly catching on, too." 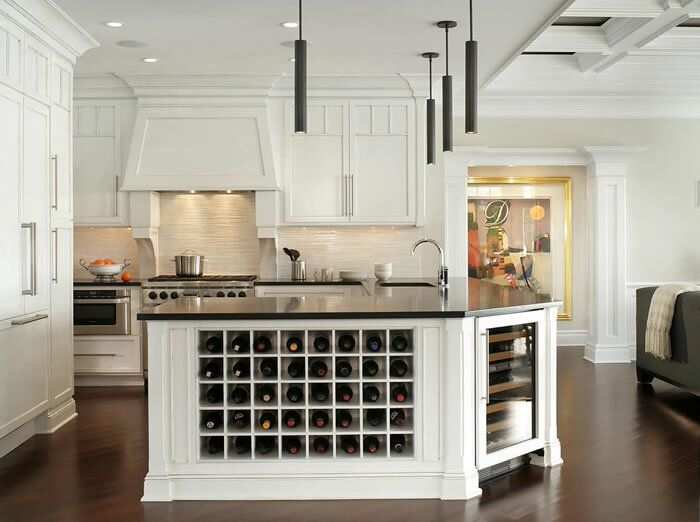 For Donner, functionality is as important as aesthetics: "Wine connoisseurs often have an extensive collection of varietal-specific glasses that they want displayed, so I get asked a lot for glass-fronted cabinets with interior lighting," she says. "Much of this stemware is oversize or extra tall, so I make sure the shelves can accommodate their height. And I always include solid-door cabinets to stow motley collections of assorted liquor bottles." Fine hardwood cabinetry can also be used to conceal icemakers, refrigerators, bottle-cooling drawers, dishwashers, and other unsightly appliances and equipment. "A small bar sink is also very useful," Donner continues. "Less for the water coming out of the spout than as a place to dump out old drinks or melted ice." Loading up your built-in bar with such practical, laborsaving features will free you up to enjoy your own party to the fullest. And that, surely, is the point of the exercise.